Thank you for this great post. I’ve been so self involved this week that it’s good to be reminded to think more about the people behind the tweets and updates. Some time the words on the page seem very important when it’s the faces behind the words that are. Stay well. I’m coming to this post a little late, but I wanted to say thank-you. I’m the kind of person who keeps a lot of her struggles extremely quiet, and I’ve had a very rough summer (starting in May). Many days I feel like I can’t handle anything more, and I hope that on those days, I don’t come across to everyone online as short-tempered or harsh. I loved the RESPECT acronym. Thank you so much for your kind words. When I saw the link to your blog, I had a feeling I might find some encouragement and a much needed distraction here today. Thanks for the fabulous, uplifting post, Karen! Sometimes we have to fake it until we make it, but it’s also important to remember that it’s okay to let people in, to show them our warts and all. My friend Gayle likes to say that if life gives you lemons to make lemon drop martinis. Me? I’m up for a martini and maybe some lemon bars. Yum. Karen, you’re a sweetie-pie! I don’t think I’ve met anyone more supportive than you are, toots. 🙂 I have a ton of respect for you, hunny. Thanks for this post. I try to be as upbeat as I can – I figure no one wants to listen to a Debbie Downer. The big bad stuff I’ll share, but then there’s little bad things…you know, the stuff that piles up and weighs you down after a while…well, that stuff I keep to myself, but you’re right, sometimes you just need to unload and get that off your chest. Usually, the way I help myself feel better is to serve – when I can do something for someone (even though it’s small), it makes me feel a LOT better! Full RESPECT to you for this post 🙂 I came here from Susie’s post and Coleen’s Facebook page! And you are so right, we are putting our best foot forward here…but there’s a whole lot more behind it. Thanks for the reminder. Such a great reminder Karen and I love the photo! That is amazing and so are you! Susie Lindau (@Susie recently posted..Use Me and Abuse Me Day – Time to Party! A beautiful post, Karen. I’m so glad you’re back. I don’t often post personal stuff. between my day job and my work as a therapist, I don’t feel that would be appropriate, but I do know there are people I can chat with and share with and talk about things. and when burnout laid me flat, I did post. it was too important to keep hidden. Louise Behiel recently posted..Given that You Have One, Do You Know How it Works? Lovely post! You are such a kind souI. I like the part about “there’s no competition” It’s so true. We each have a unique voice and different things to offer the world. “T” could also stand for Tribe! I don’t know what I’d do without you all, writing was a much lonlier place before WANA! Karen, wow. Just WOW. You are an amazing person with a heart bigger than Texas. RESPECT. Boy, do I have respect for you. I have been awed and touched by you and all my WANA friends. Thank you. You are an inspiration. Oh my Gosh, I suffer from all of those things. I just chalk it up to living a rich and full life! You have to take the bad in order to appreciate the good. Thanks for sharing your story, Karen so we can all appreciate you a little more. Karen this is so beautiful–I’m teary. Yes, I’m overwhelmed. I really do like blogging, especially the creative aspect and being able to make it my own, but you’re right there are some things that I feel cannot be talked about on my blog. So then sometimes it’s hard to feel like I’m being genuine. A truly beautiful post, Karen. You always brighten my day. I’m so grateful to have you as a friend. Wishing many sunny blessings upon you! Karen, you are such a ray of sunshine every day. Thank you for all you do for all of us, from the bottom of my heart. You’re a very generous, giving soul, Karen. I wish I was more like you. Note to self: must try. Katherine Owen – Novelist recently posted..Who does it work out for, Kit? Ginger Calem recently posted..WritersButt Wednesday – Back in Action! Karen, you’ve got such a sweet heart. Very glad to know you. Lovely post. You are an amazing, compassionate woman, Karen. It’s wonderful peeps like you who help me deal with the curve balls life throws at us. None of us is exempt. Nope, we all deal with rough patches. Some more so than others. You’re a pro at making lemonade out of lemons! Wonderful post, Karen. I’ve actually never seen that photo of lemon monuments before. 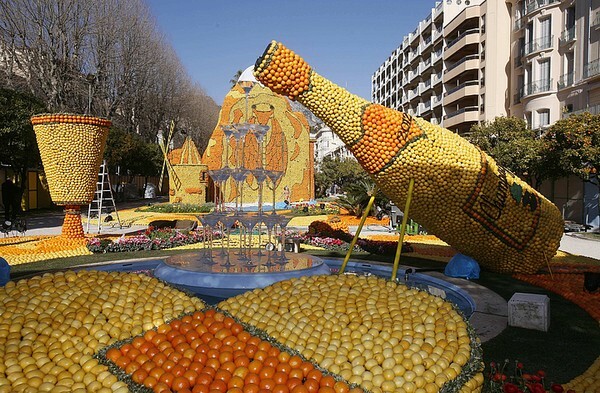 Umm, wow…what an impressive array of well-placed lemons. Things are pretty good for me these days. Life threw me a curve in late 2010 when I got laid off from my job of 12 years, but I’ve decided to use it as an opportunity to prepare myself to do something else. I loved the work I used to do, but I had doubts that my previous career was sustainable into my 50s, 60s, and beyond. Great post! All so true. I’m one of those who’s been toying with burnout. Taking some time to just ride my motorcycle and a couple weeks of reduced social media and writing helped a great deal. I have chronic headaches, but I don’t usually mention that – if I did, I’d be writing about it all the time and who wants to read me whining ? I sure don’t LOL. I know sometimes it seems like my day job takes up so much time, but every time that thought sneaks into my head, I really do remember how much of a blessing it is. Not only does it provide me with a nice paycheck and enable me to pay the bills, I like what I do, and I work with wonderful people – some of whom even read my books! I hope you and your readers know that they can share the tough times and feelings, too. Big hug right back at ya! What a wonderful post, Karen. You know what the best reward in this venture has been for me? It’s the quality of the friendships I have been blessed with since first setting foot on this path. Truly I am bless with rewards aplenty. Karen, this post was awesome. A great reminder that behind the computer screens sit real, live people. I’m so fortunate to have a chance to connect via this medium. It’s added more to my life than anything this past year.